This is an early example of a red brick Farmhouse which was re-modelled in the 1970s when the original leaded lights and wooden windows were enlarged and replaced with cast, reinforced, reconstituted stone mullion surrounds and storm-proof galvanised Crittal style casements. Over a period of around fifty years the galvanised steel frames remained in very good condition however the reinforcing cable within the cast mullions did not. Deep seated corrosion was present and this in turn expanded and split the stone with many large sections of stonework breaking free. The first thought was to replace the cast stone surrounds with natural stone mullioned surrounds and possibly restore and re-use the existing galvanised steel frames however replace the single glazing with slim-line sealed units if the local conservation officer would allow. A picture of the property with the original leaded windows with timber frames was found and it was agreed that if these could be replicated however with the introduction of sealed unit double glazing and weather stripping as the original style of windows would have been very draughty this may be an option the conservation officer would approve of? The sealed units to be manufactured in Planetherm low emmisivity glass, be argon filled and to have stick on lead cames with soldered joints to mimic genuine leaded lights as closely as possible. The opening casements to close directly into weather stripped timber rebates. The opening casements be of a very traditional flat iron design hung on Pintal type hinges with handmade traditional ring latches and stays modified to accept the sealed units. The overall appearance to be that of a very traditional timber frames windows glazed with leaded lights. In practice the windows would be thermally efficient draught proof double glazed windows. The only compromise to modern requirements being the lack of a thermal break in the iron frames. The local conservation was contacted and agreed that in principle that provided the windows could be of a similar hand crafted appearance and design to the original leaded timber windows he would consider the application. It was agreed that the windows would have heavy 4”oak sub frames. The fixed lights would be fitted and sealed directly into the oak sub frames, the iron casements and face puttied to give the appearance of traditional glazing. The oak sub frames would be treated with a wood preserver and oiled with external wood oil which would allow the oak to age naturally and silver over time adding to the overall effect. Drawings of the proposed sections and details were produced and the application for listed buildings consent was applied for. The design and materials to be used were approved by the local conservation officer, subsequently inspected by both the conservation officer and the building inspector. Everyone was extremely happy with the results. At Glasswood we will go the extra mile to produce bespoke windows to meet your requirements and those of the relevant authorities. 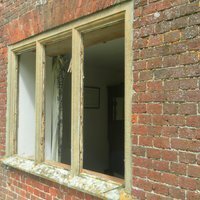 Were have many years of experience dealing with listed buildings, buildings in conservation areas and properties where standard designs or modern off the shelf windows and glass are not acceptable. We try to apply a little lateral thinking as required to find a compromise which meets our customers needs. Our relationship with customers is very important to us and we strive to ensure their joinery requirements are met fully by achieving their specification on time and on budget. Over time we have built a strong reputation for value for money and excellent quality products. Please take the time to have a look through our site and if we can be of any assistance please contact us as we would welcome the opportunity to help.